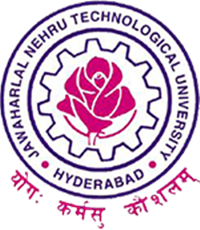 Jawaharlal Nehru Technological University Hyderabad (JNTUH) offers a 4-year (8 semesters) Bachelor of Technology (B.Tech.) degree programme, under Choice Based Credit System (CBCS) at its non-autonomous constituent and affiliated colleges with effect from the academic year 2018-19. Admission to the under graduate (UG) programme shall be made either on the basis of the merit rank obtained by the qualified student in entrance test conducted by the Telangana State Government (EAMCET) or the University or on the basis of any other order of merit approved by the University, subject to reservations as prescribed by the government from time to time. The medium of instructions for the entire under graduate programme in Engineering & Technology will be English only. A student after securing admission shall complete the B.Tech programme in a minimum period of four academic years (8 semesters), and a maximum period of eight academic years (16 semesters) starting from the date of commencement of first year first semester, failing which student shall forfeit seat in B.Tech course. Each student shall secure 160 credits (with CGPA ≥ 5) required for the completion of the under graduate programme and award of the B.Tech degree. UGC/AICTE specified definitions/descriptions are adopted appropriately for various terms and abbreviations used in these academic regulations/ norms, which are listed below. Each under graduate programme is of 4 academic years (8 semesters) with the academic year divided into two semesters of 22 weeks (≥90 instructional days) each, each semester having – ‘Continuous Internal Evaluation (CIE)’ and ‘Semester End Examination (SEE)’ under Choice Based Credit System (CBCS) and Credit Based Semester System (CBSS) indicated by UGC, and curriculum/course structure as suggested by AICTE are followed. 1. All subjects/ courses are to be registered by the student in a semester to earn credits which shall be assigned to each subject/ course in an L: T: P: C (lecture periods: tutorial periods: practical periods: credits) structure based on the following general pattern. One credit for one hour/ week/ semester for theory/ lecture (L) courses or Tutorials. One credit for two hours/ week/ semester for laboratory/ practical (P) courses. 2. Courses like Environmental Science, Constitution of India, Intellectual Property Rights, and Gender Sensitization lab are mandatory courses. These courses will not carry any credits. All subjects/ courses offered for the under graduate programme in E&T (B.Tech. degree programmes) are broadly classified as follows. The University has followed almost all the guidelines issued by AICTE/UGC. 4 Core Courses (CoC) PC – Professional Core Includes core subjects related to the parent discipline/ department/ branch of Engineering. 5 Elective Courses (EℓC) PE – Professional Electives Includes elective subjects related to the parent discipline/ department/ branch of Engineering. 6 OE – Open Electives Elective subjects which include inter- disciplinary subjects or subjects in an area outside the parent discipline/ department/ branch of Engineering. 9 Seminar Seminar/ Colloquium based on core contents related to parent discipline/ department/ branch of Engineering. 1. A ‘faculty advisor or counselor’ shall be assigned to a group of 20 students, who will advise the students about the under graduate programme, its course structure, and curriculum, choice/option for subjects/ courses, based on their competence, progress, pre-requisites and interest. 2. The academic section of the college invites ‘registration forms’ from students before the beginning of the semester through ‘on-line registration’, ensuring ‘date and time stamping’. The on-line registration requests for any ‘current semester’ shall be completed before the commencement of SEEs (Semester End Examinations) of the ‘preceding semester’. 3. A student can apply for on-line registration, only after obtaining the ‘written approval’ from faculty advisor/counselor, which should be submitted to the college academic section through the Head of the Department. A copy of it shall be retained with Head of the Department, faculty advisor/ counselor and the student. 4. A student may be permitted to register for all the subjects/ courses in a semester as specified in the course structure with maximum additional subject(s)/course(s) limited to 4 credits, based on progress and SGPA/ CGPA, and completion of the ‘pre-requisites’ as indicated for various subjects/ courses, in the department course structure and syllabus contents. 5. Choice for ‘additional subjects/ courses’ must be clearly indicated, which needs the specific approval and signature of the faculty advisor/ counselor. 6. If the student submits ambiguous choices or multiple options or erroneous entries during on-line registration for the subject(s)/course(s) under a given/ specified course group/ category as listed in the course structure, only the first mentioned subject/ course in that category will be taken into consideration. 7. Subject/ course options exercised through on-line registration are final and cannot be changed or inter-changed; further, alternate choices also will not be considered. However, if the subject/ course that has already been listed for registration by the Head of the Department in a semester could not be offered due to any unforeseen or unexpected reasons, then the student shall be allowed to have alternate choice either for a new subject (subject to offering of such a subject), or for another existing subject (subject to availability of seats). Such alternate arrangements will be made by the head of the department, with due notification and time-framed schedule, within the first week after the commencement of class-work for that semester. 8. Dropping of subjects/ courses may be permitted, only after obtaining prior approval from the faculty advisor/ counselor ‘within a period of 15 days’ from the beginning of the current semester. 9. Open electives: The students have to choose three open electives (OE-I, II & III) from the list of open electives given. However, the student cannot opt for an open elective subject offered by his own (parent) department, if it is already listed under any category of the subjects offered by parent department in any semester. 10. Professional electives: The students have to choose six professional electives (PE-I to VI) from the list of professional electives given. 1. A typical section (or class) strength for each semester shall be 60. 2. A subject/ course may be offered to the students, only if a minimum of 20 students (1/3 of the section strength) opt for it. The maximum strength of a section is limited to 80 (60 + 1/3 of the section strength). 3. More than one faculty member may offer the same subject (lab/ practical may be included with the corresponding theory subject in the same semester) in any semester. However, selection of choice for students will be based on – ‘first come first serve basis and CGPA criterion’ (i.e. the first focus shall be on early on-line entry from the student for registration in that semester, and the second focus, if needed, will be on CGPA of the student). 4. If more entries for registration of a subject come into picture, then the Head of the Department concerned shall decide, whether or not to offer such a subject/ course for two (or multiple) sections. 5. In case of options coming from students of other departments/ branches/ disciplines (not considering open electives), first priority shall be given to the student of the ‘parent department’. 1. A student shall be eligible to appear for the semester end examinations, if the student acquires a minimum of 75% of attendance in aggregate of all the subjects/ courses (excluding attendance in mandatory courses like Environmental Science, Constitution of India, Intellectual Property Rights, and Gender Sensitization lab) for that semester. Two periods of attendance for each theory subject shall be considered, if the student appears for the mid-term examination of that subject. This attendance should also be included in the fortnightly upload of attendance to the University. The attendance of Mandatory Non-Credit courses should be uploaded separately to the University. 2. Shortage of attendance in aggregate up to 10% (65% and above, and below 75%) in each semester may be condoned by the college academic committee on genuine and valid grounds, based on the student’s representation with supporting evidence. 3. A stipulated fee shall be payable for condoning of shortage of attendance. 4. Shortage of attendance below 65% in aggregate shall in no case be condoned. 5. Students whose shortage of attendance is not condoned in any semester are not eligible to take their end examinations of that semester. They get detained and their registration for that semester shall stand cancelled. They will not be promoted to the next semester. They may seek re-registration for all those subjects registered in that semester in which the student is detained, by seeking re-admission into that semester as and when offered; if there are any professional electives and/ or open electives, the same may also be re-registered if offered. However, if those electives are not offered in later semesters, then alternate electives may be chosen from the same set of elective subjects offered under that category. 6. A student fulfilling the attendance requirement in the present semester shall not be eligible for readmission into the same class. The following academic requirements have to be satisfied, in addition to the attendance requirements mentioned in item no.6. 1. A student shall be deemed to have satisfied the academic requirements and earned the credits allotted to each subject/ course, if student secures not less than 35% (26 marks out of 75 marks) in the semester end examination, and a minimum of 40% (40 marks out of 100 marks) in the sum total of the CIE (Continuous Internal Evaluation) and SEE (Semester End Examination) taken together; in terms of letter grades, this implies securing ‘C’ grade or above in that subject/ course. 2. A student shall be deemed to have satisfied the academic requirements and earned the credits allotted to Industrial Oriented Mini Project/Summer Internship and seminar, if the student secures not less than 40% marks (i.e. 40 out of 100 allotted marks) in each of them. The student is deemed to have failed, if he (i) does not submit a report on Industrial Oriented Mini Project/Summer Internship, or does not make a presentation of the same before the evaluation committee as per schedule, or (ii) does not present the seminar as required in the IV year I Semester, or (iii) secures less than 40% marks in Industrial Oriented Mini Project/Summer Internship and seminar evaluations. A student may reappear once for each of the above evaluations, when they are scheduled again; if the student fails in such ‘one reappearance’ evaluation also, the student has to reappear for the same in the next subsequent semester, as and when it is scheduled. 1 First year first semester to first year second semester Regular course of study of first year first semester. 2 First year second semester to second year first semester (i) Regular course of study of first year second semester. (ii) Must have secured at least 18 credits out of 37 credits i.e., 50% credits up to first year second semester from all the relevant regular and supplementary examinations, whether the student takes those examinations or not. 3. Second year first semester to second year second semester Regular course of study of second year first semester. 4 Second year second semester to third year first semester (i) Regular course of study of second year second semester. (ii) Must have secured at least 47 credits out of 79 credits i.e., 60% credits up to second year second semester from all the relevant regular and supplementary examinations, whether the student takes those examinations or not. 5 Third year first semester to third year second semester Regular course of study of third year first semester. 6 Third year second semester to fourth year first semester (i) Regular course of study of third year second semester. (ii) Must have secured at least 73 credits out of 123 credits i.e., 60% credits up to third year second semester from all the relevant regular and supplementary examinations, whether the student takes those examinations or not. 7 Fourth year first semester to fourth year second semester Regular course of study of fourth year first semester. HOW MANY CREDITS ARE ALLOTED FOR EACH SUBJECT?